Great groove reminiscent of Milt Jackson's Bag's Groove. 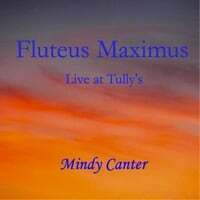 Mindy Canter's ability to play many styles and articulate with genuine mastery is the cornerstone of her appeal. Her blend of blues, jazz, funk, and soul is rhythmically infectious and has been widely acclaimed. It is really a treat to experience such a passionate, soulful performer, as she mixes musical genres with grace and ease. The listener can immediately hear the joy in her playing no matter the genre being presented. Music was always a destiny for Mindy Canter. At a young age. she learned to read music before she could read words. She began playing piano at the age of 4, and added the flute at the age of 9. Although classically trained, Mindy's earliest creative influences were blues and jazz, and later soul, funk, roots, rock n roll...and anything else she could wrap her flute or keyboards around. At age 19 Mindy performed with Albert King and over the years with Michael Bloomfield, Boz Scaggs, Nick Gravenites, It's A Beautiful Day, Dan Hicks, Rodney Jones, Roger Glenn, Ray Obiedo, and Grammy winner Terrence Simien, among many others. In 1977 Canter recorded a full length African Highlife record with Souleman E. Rowgie (world famous singer/songwriter from Sierra Leona, West Africa), playing keyboards and flute on all tracks. Last year Canter released a single duet with Yo-Yo Ma entitled Dona Nobis Pacem (Give Us Peace).